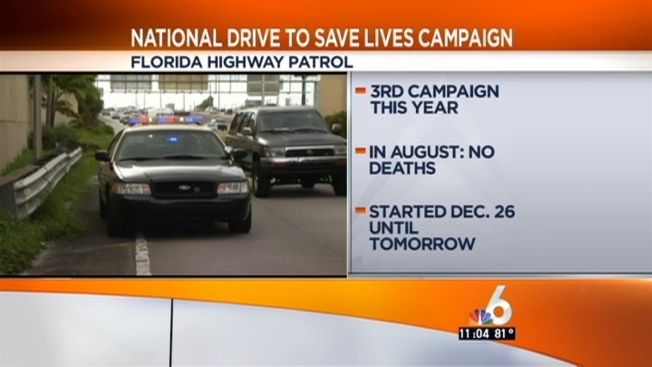 The Florida Highway Patrol is teaming up with law enforcement across the entire Eastern Seaboard for a campaign aimed at reducing traffic fatalities on the Interstate 95 corridor. The "Drive to Save Lives" campaign focuses on the use of seatbelts, speeding, and targets impaired and distracted drivers. It's targeted on the Christmas to New Year's holiday season, which is among the busiest long-dstance travel times of the year. By partnering with agencies across the eastern United States, the campaign aims to change the high-risk behaviors of motorists that lead to crashes through education, awareness, and high-visibility traffic enforcement. According to FHP, more than 33,000 highway fatalities occur each year on our nation's highways, making highway crashes one of the top 12 causes of death in the United States and the leading cause of death among teens. The announcement of the campaign comes just as a horrific wrong-way crash on Interstate 95 killed five people, including the wrong-way driver, Wednesday morning. "These campaigns are to educate the public," said Joe Sanchez of Florida Highway Patrol while responding to Wednesday's crash. "These are the types of accidents that we want to prevent. Our mission is to save lives out here." Sanchez took the opportunity to remind drivers of the reflectors which are clearly marked on I-95. If they are white, you're traveling the right way. If they're red, you're traveling in the wrong direction. The public can help by reporting aggressive or impaired drivers by dialing *FHP (*347).